Free guided bus tour around Scotland’s Capital Port, offering you and your family the opportunity to see it operate and understand the work that goes on! Bus tours depart from the Prince of Wales Gate, next to the Vine Trust barge, only 200m walk from the Malmaison Hotel on The Shore. Bus tours depart at 10am, 11am, 12pm, 1pm, 2pm & 3pm. 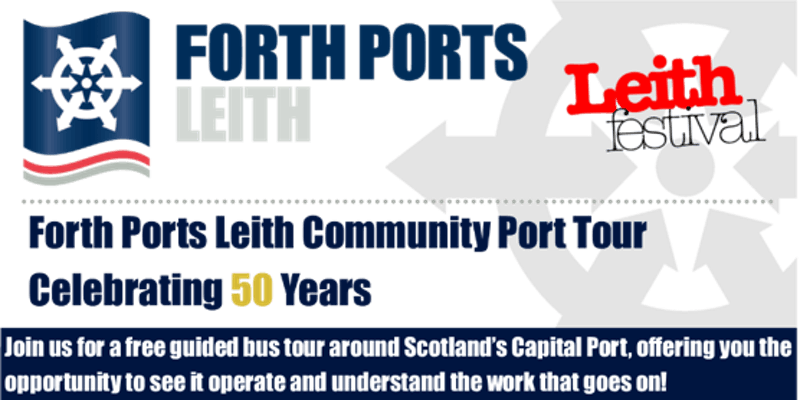 Book your free tickets now, via https://www.eventbrite.co.uk/e/forth-ports-leith-community-port-tour-tickets-45100564001! This entry was posted in Events, Entertainment & What's on, LHNCC area and tagged Forth Ports, public events. Bookmark the permalink.